Dull? A lot of multimedia notebook for a small price - that is what the Sony Vaio SV-E1712F1EW wants to be and abstains from expensive high-end hardware and luxury materials. We clarify whether the 17-inch notebook is a true price cutter or just hides a lot of painful economies. Sony is not a manufacturer that many users would associate with affordable entry-level notebooks - yet the Japanese electronics giant offers inexpensive models in its E-series, varying from 14- to 17-inch form factor. 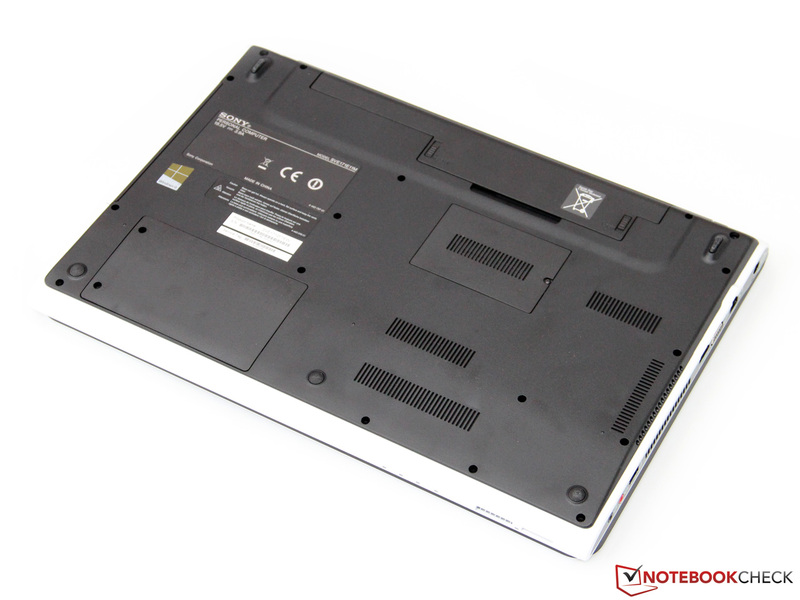 Now that we have taken a look at the middle 15-inch model (Vaio SV-E1511V1EW), today we review the SV-E1712. This 17-inch notebook comes in various configurations, starting at 500 Euros (~$635). But equip it with a quad-core processor, Blu-ray drive, and a Full HD display and it can easily go over the 1000 Euros (~$1273) mark. Such hardware seems to be overkill for a simple multimedia notebook. 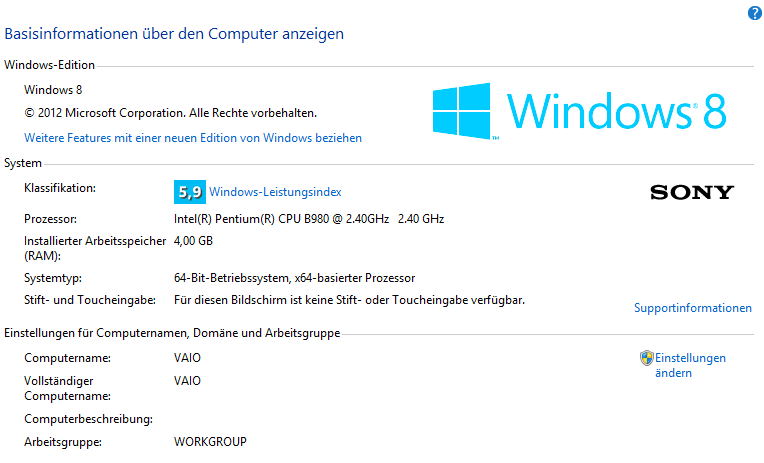 Our test candidate, a Sony Vaio SV-E1712F1EW, relies on a Pentium B980 CPU, 4 GB of RAM, and a 500 GB HDD, which reduces the price to 550 Euros (~$699). 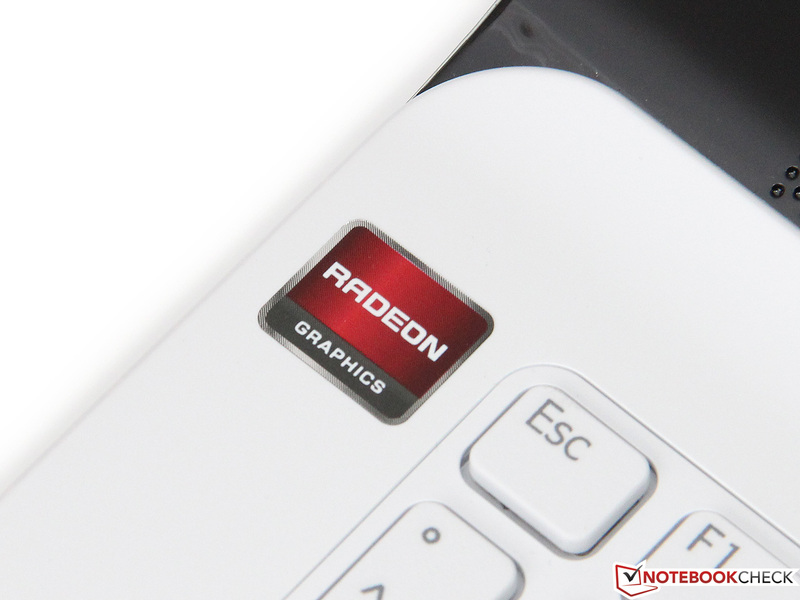 The Radeon HD 7650M is here too - it is a standard feature on all of the models in the range. Sony should not worry about the lack of competition: in particular, the new Trinity APUs by AMD are widely used in this price range and are installed in the HP Pavilion g7 for example. But which manufacturer has put together the most attractive package? 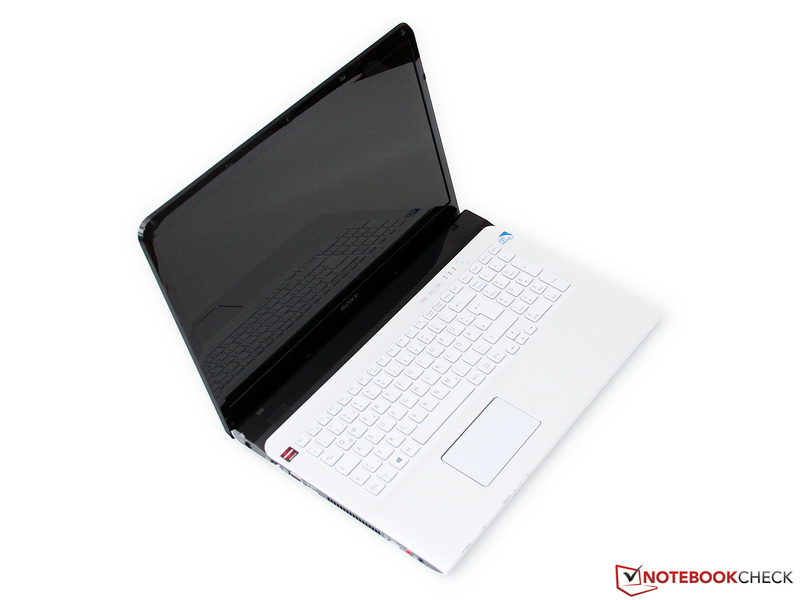 Similarly to its small sister model, the Vaio SV-E1712 comes in an interesting, two-color look: black and white plastic (other combinations also available) make for a diverse combination that distinguishes the notebook from the usually dull masses. Apart from the color, Sony has chosen not to experiment with the rest of the design - unfortunately that includes the dirt-prone glossy surfaces. 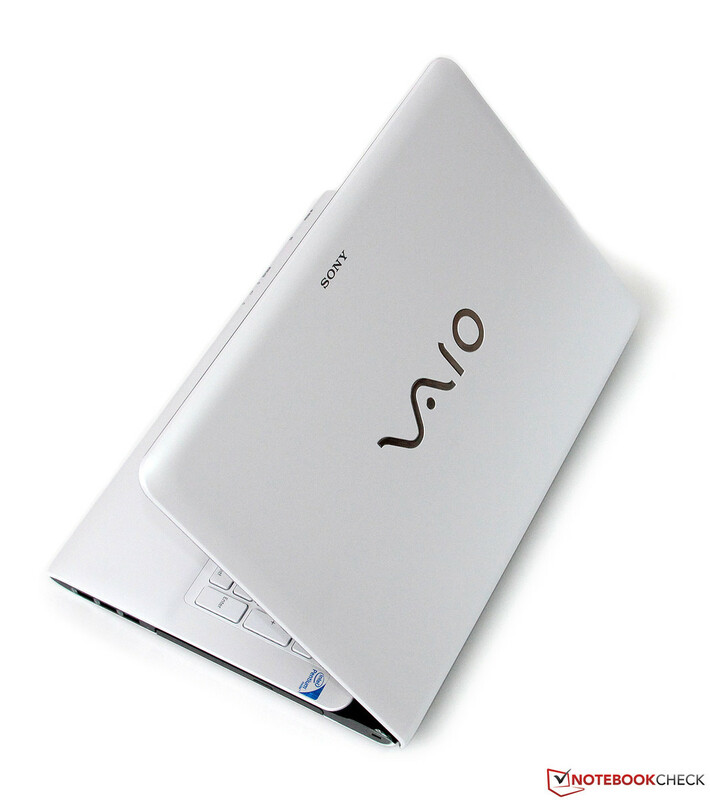 Without the use of light metals such as aluminum, the Vaio cannot score points with compact dimensions (38 mm thickness) or low weight (3.2 kg). 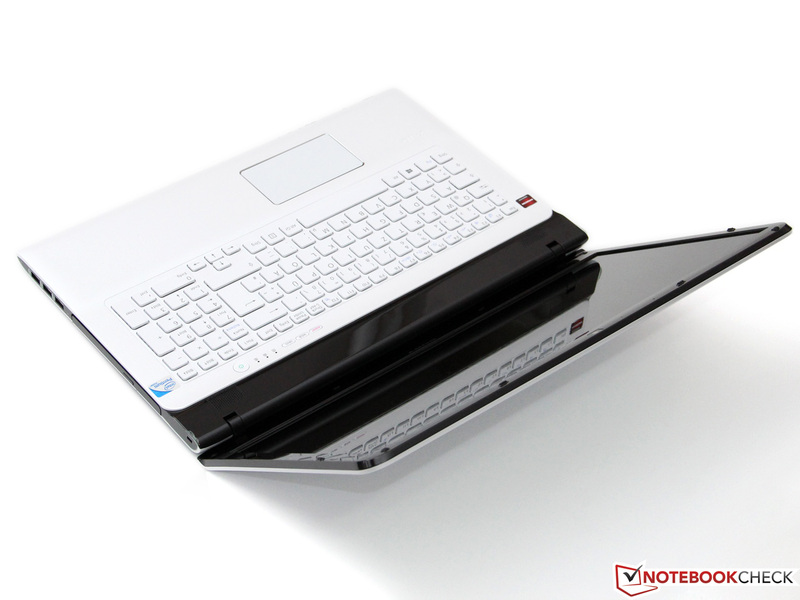 The mobility is not among the notebook's strong points, but it has, for this price range, a properly good stability and workmanship. 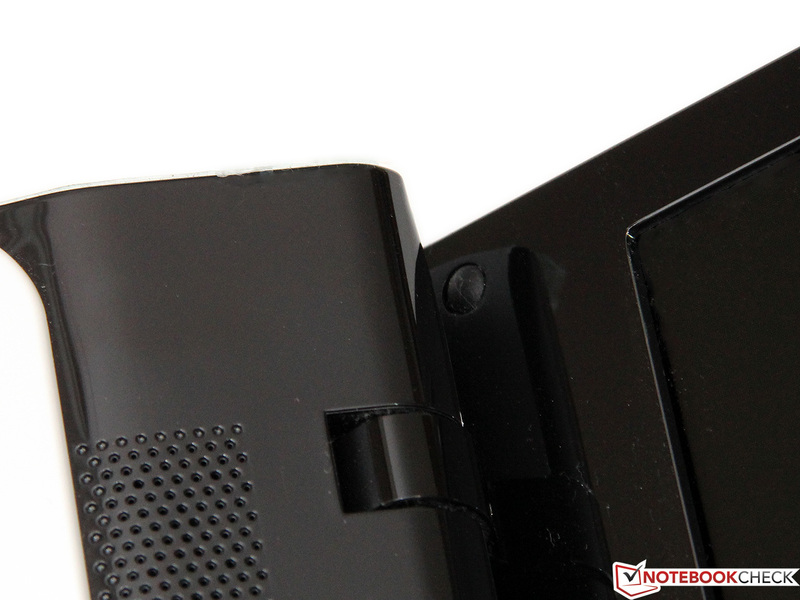 Pressure on the case is met with minimal deformation, for example, in the area of the DVD drive. In detail, some gaps and material transitions could be improved, but overall we found no major shortcomings to be criticized. The display is held in position by two tight hinges, which wobble a bit after opening. Both the base unit and the display lid are made of simple, but solid plastic, which leads to a proper rigidity. Overall, the SV-E1712 places just ahead of the HP Pavilion g7, but still has room for improvement. 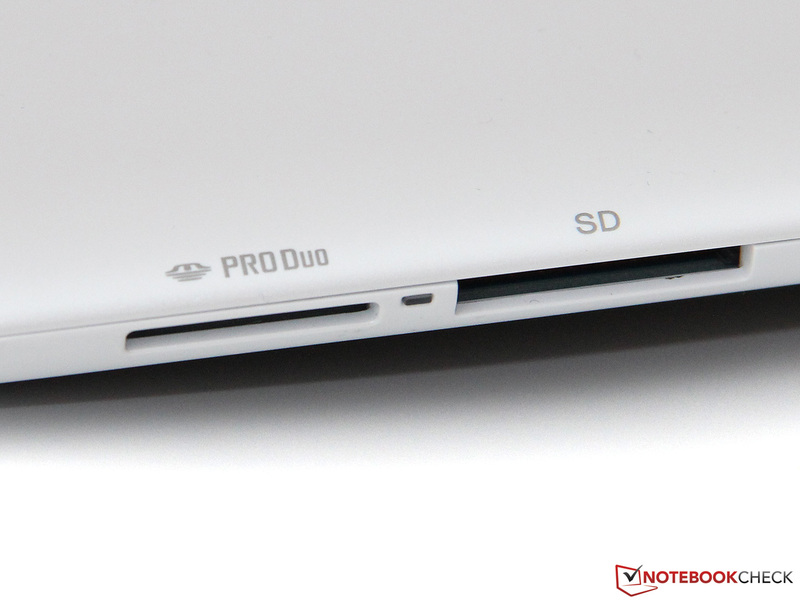 It took a couple of years, but now USB 3.0 is standard even for the cheaper notebooks. 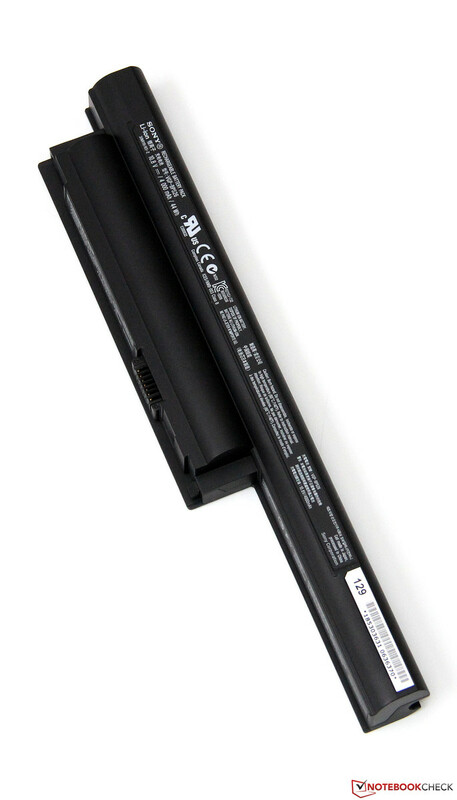 The Vaio SV-E1712 is limited to only one port, although this should suffice for the connection of fast USB sticks and external hard drives. 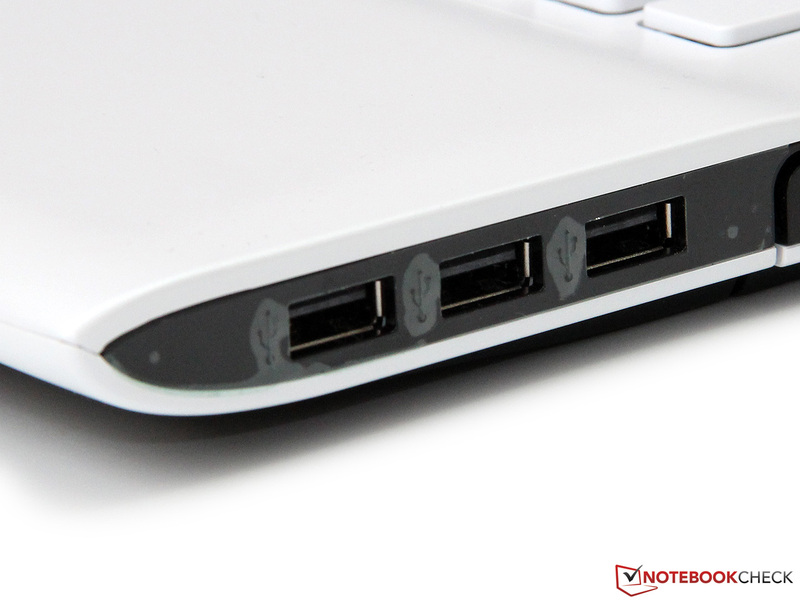 The three USB 2.0 ports provide more than adequate transfer rate for most peripherals. Beyond that, Sony has included the essentials: HDMI and VGA for video output, Gigabit LAN, and the mandatory audio jacks (3.5 mm) - all located on the sides of the notebook. The rear is left empty, while the front houses the two card readers for MS (Pro Duo) and SD memory cards. Annoyingly, the distances between the interfaces are too small, which leads to the HDMI and VGA blocking each other. 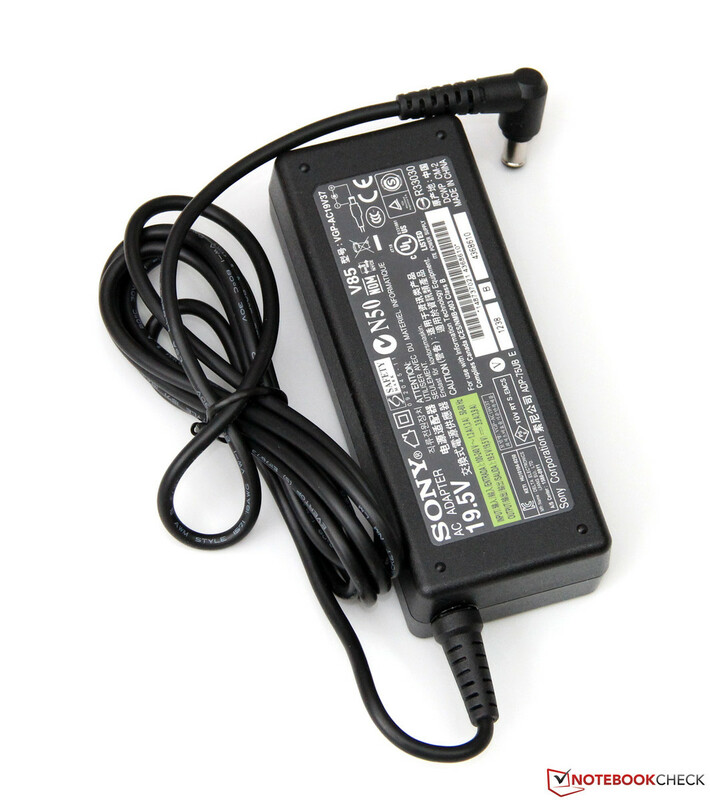 Due to its low price, the Vaio has a relatively simple WLAN adapter. The Qualcomm/Atheros AR9485WB-EG supports only the 802.11b/g/n standards and is limited to the 2.4 GHz bandwidth (no support for 5 GHz networks). While the promised maximum transfer rate of 150 MBit/s seems quite mediocre, the range and connection stability leave no room for criticism. In addition to WLAN, the SV-E1712 is also equipped with a Bluetooth module of the current Version 4.0. 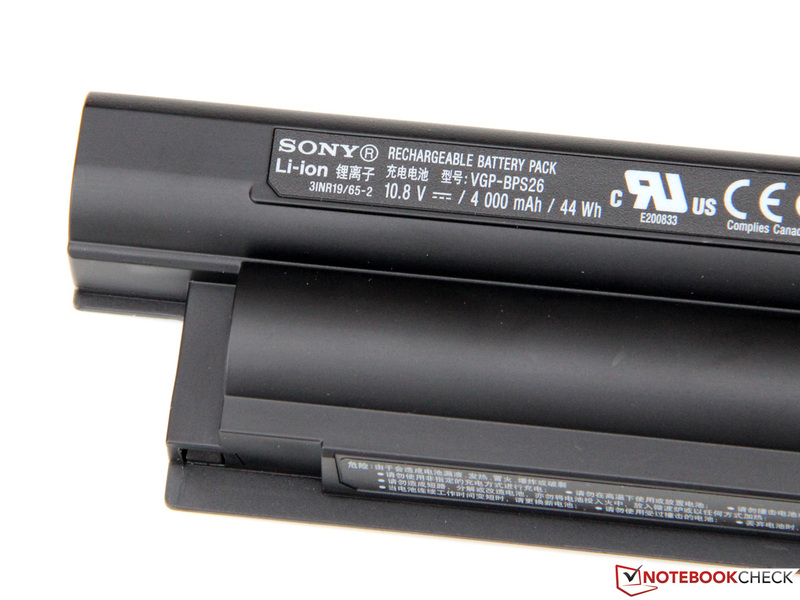 Sony has waived the extensive accessories package and has included no other extras besides the notebook, the battery, the 75 W power supply and the usual pamphlets. However, the pre-installed software is abundant. In addition to the system tools (Vaio Update, Vaio Control Center) we also find a couple of applications, such as the CyberLink PowerDVD and the burning software Power2Go. The operating system is the new Windows 8 (64 Bit), while the proven Windows 7 is only available on the predecessor model Vaio SV-E1711. The maintenance/upgrade options only cover the system memory and the hard drive. Two DIMM slots, one of which is free, allow a maximum of 16 GB RAM. The installed hard drive can be exchanged for a different model or an SSD. There is no mSATA slot. The user is not given the option to clean the fan and the heat sink. In principle, the warranty period of 12 months seems meager, but it can be extended to two years at no extra cost. This requires two things: the notebook must be purchased from a "Sony Europe Retail Partner" - if in doubt, ask the dealer directly - and must be registered with the manufacturer afterwards. In addition, there are service packages available at a surcharge (+1 year at about 95 Euros, ~$120; +2 years at about 170 Euros, ~$216). Despite the larger dimensions of the 17-inch chassis, the SV-E1712 uses the same input devices as the 15-inch sister model. We would like to point you to the corresponding review and just summarize the key points here. 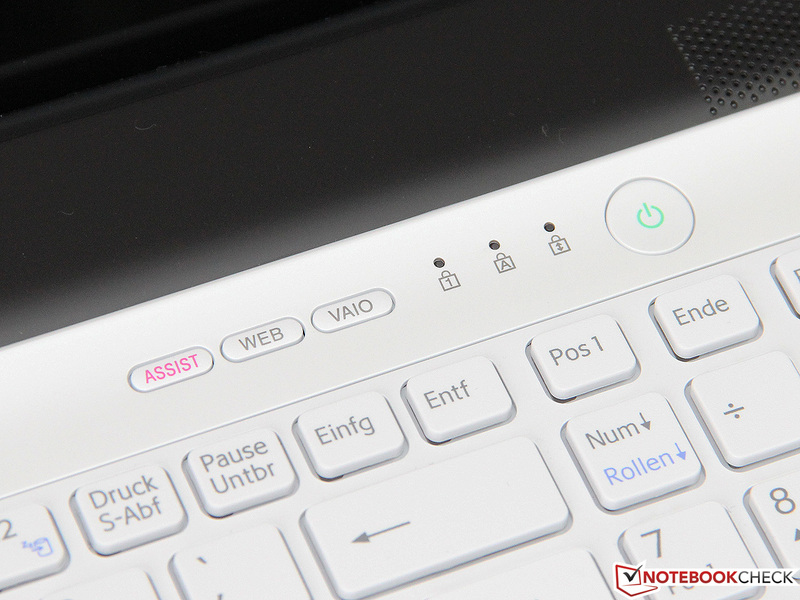 A good keyboard is not restricted to just being found on expensive business notebooks: the affordable Vaio convinces us with a crisp, medium-strength stop and excellent feedback thanks to the brushed surface of the keys. The bad workmanship and loud noise we criticized last time are now gone. Only the slight wobble during energetic typing is still present. 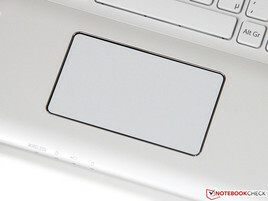 The 10 x 5.6 cm small touchpad is somewhat lost in the 40 cm wide palm rest; in order to move the cursor from one end of the screen to the other, one must lift his finger a couple of times. However, the Synaptics device has above average precision and excellent gliding properties. 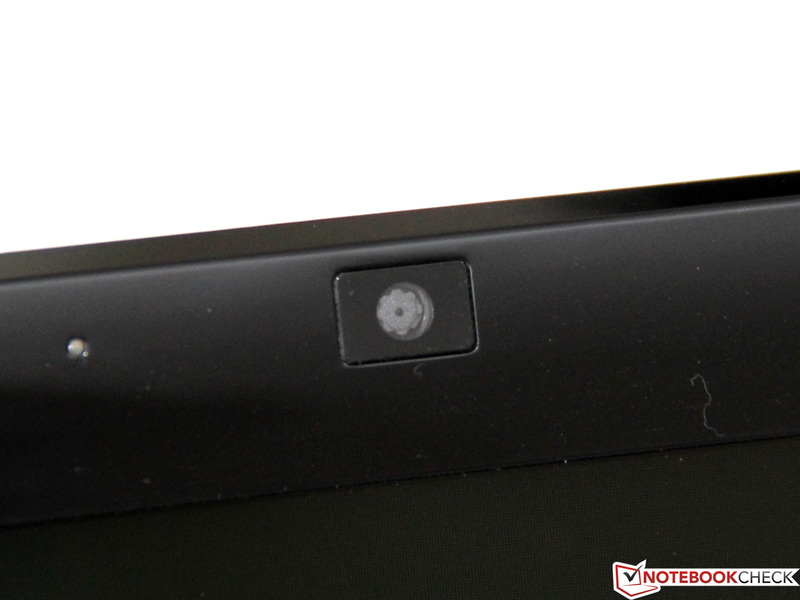 The mouse buttons, integrated below in the touchpad, could have had a slightly firmer pressure point, but otherwise perform their task perfectly. Regardless of the increasingly larger resolution of the smartphones, tablets, and ultrabooks, the 17-inch notebook standard is still 1600x900 pixels. 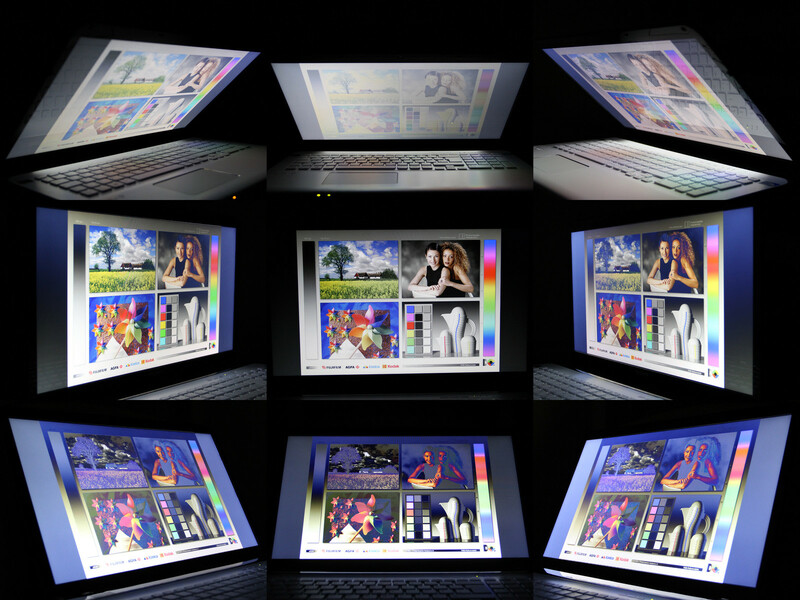 The resulting pixel density of 106 dpi makes for a large enough image, but it limits the available working space. 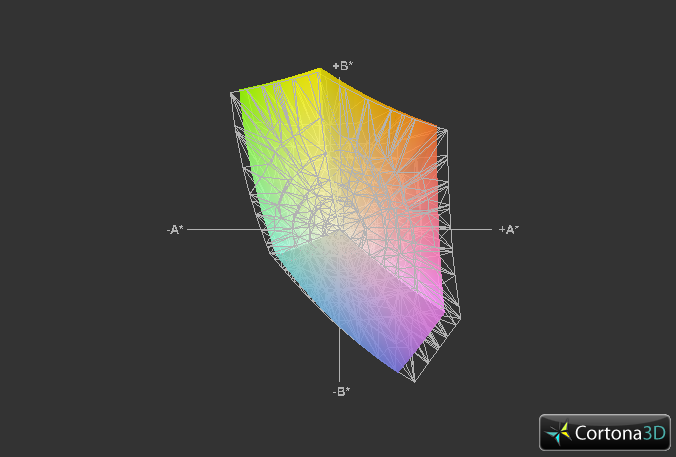 The display, with LED backlight and 11 adjustment steps, has a good maximum brightness of 244 cd/m². 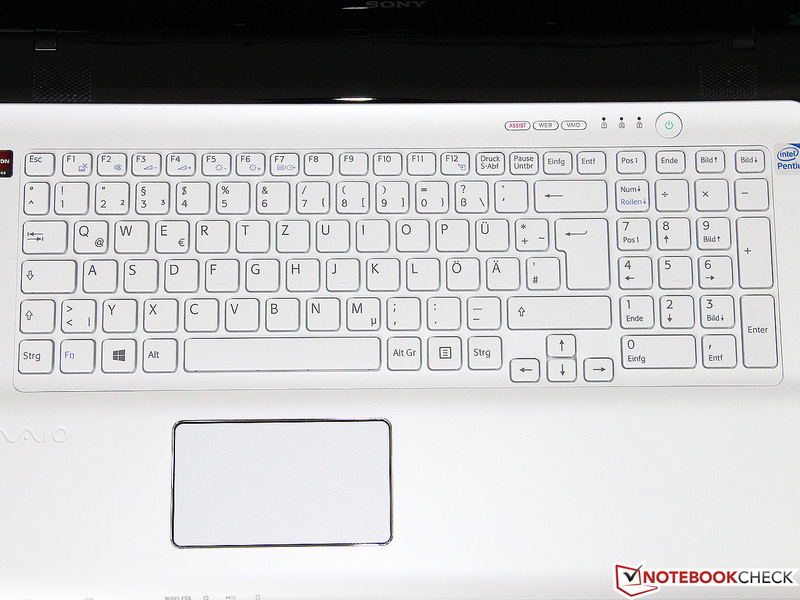 The Vaio is even brighter than most of the competition: the HP Pavilion g7 could only achieve 180 cd/m². The illumination is very uniform across the whole screen, leaving no bright patches or other irregularities. The panel itself is manufactured by Samsung (173KT02S01) and is of the conventional TN type. With a contrast ratio of 268:1 it easily beats other entry-level notebooks, although the black level seems mediocre at full brightness (0.92 cd/m²). Sony's Vaio SV-E1712 counts among the consumer notebooks and does need to have an extensive color space coverage - at least if the customer does not use graphics application or Photoshop too much. The sRGB color space is covered to about 75%, which does not hinder the everyday use of the device. 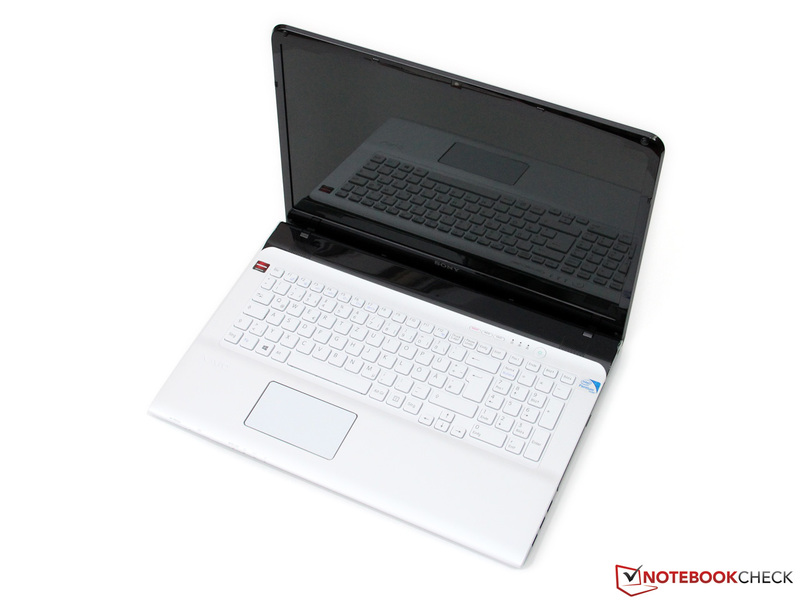 Since the Vaio is a large multimedia notebook, it is supposed to rarely be used outdoors. 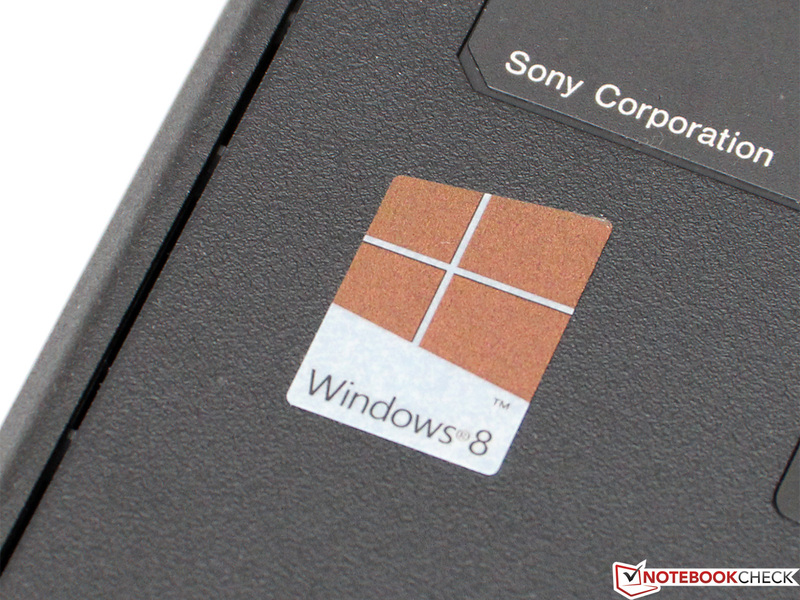 Thus, Sony has chosen to go with a glossy surface. If you venture outside, the viewing experience is quickly affected by disturbing reflections. However, thanks to its high brightness, the display is appropriate for use in the shades away from direct sunlight. As is the case with most TN panels, the Samsung display in our test candidate has poor viewing angles. 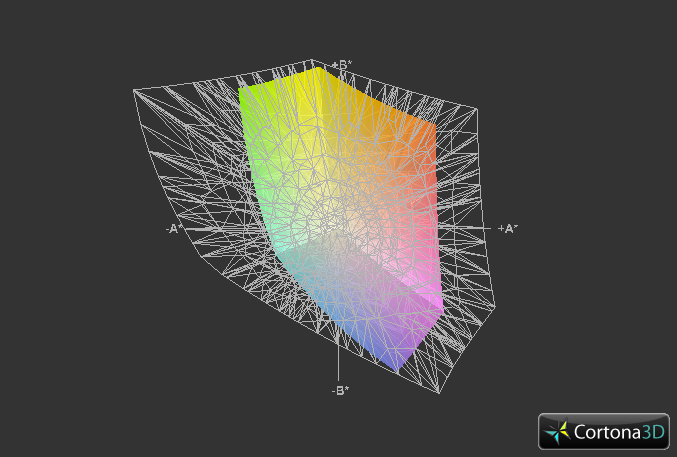 Even slight deviations up or down cause the decrease of contrast and the distortion of colors. Horizontally, the viewer again has very little freedom of movement - poor conditions for a movie night. While the Core i3, i5, and i7 make up the medium and high-priced segments of Intel's portfolio, the Pentium and Celeron models make up the entry level. 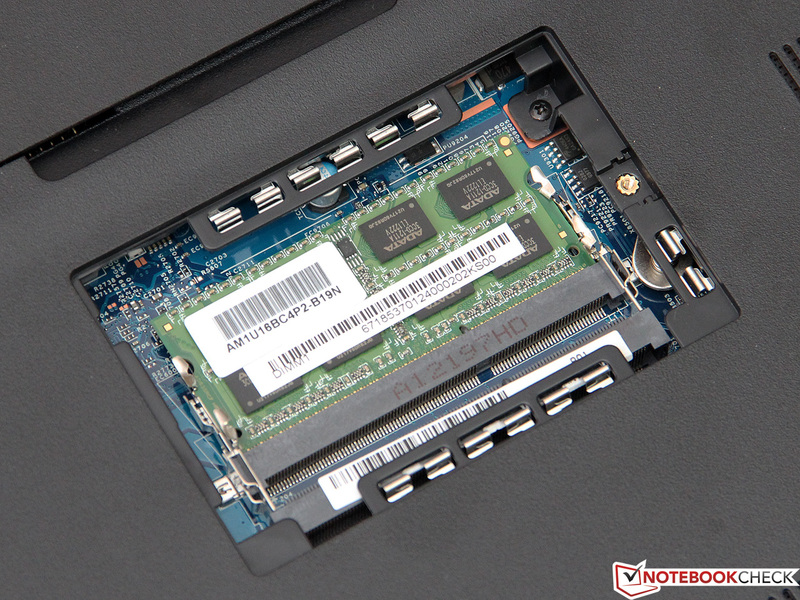 In the Vaio SV-E1712F1EW we find the recently introduced Pentium B980, which is based on the older Sandy Bridge generation. 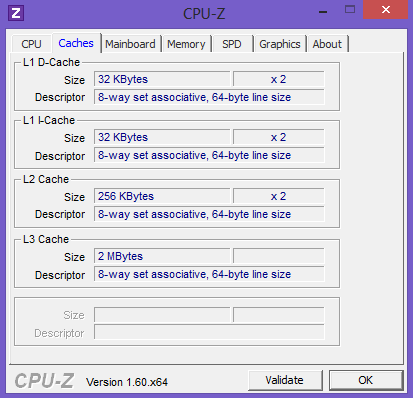 The 32nm dual-core processor runs at 2.4 GHz, but must do without Turbo Boost and other features, such as Hyper-Threading. 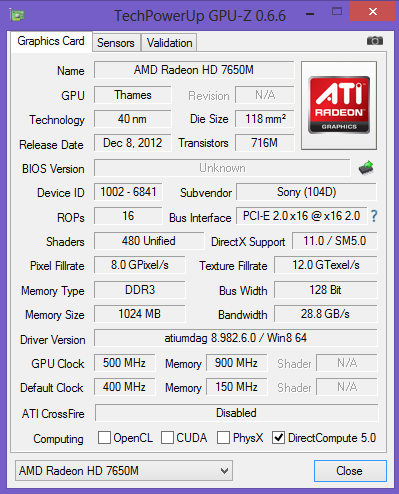 AMD's Radeon HD 7650M is in charge of the video output. Interestingly, the Enduro technology, which automatically switches between the AMD GPU and the integrated Intel graphics (HD Graphics), has not been implemented - the HD 7650M is constantly active, which in turn leads to increase in energy consumption and shorter battery life. 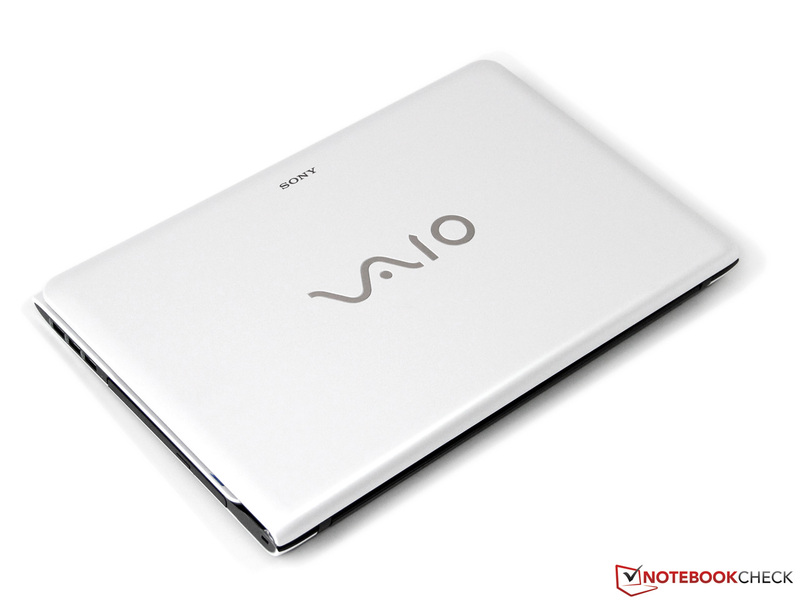 With a 500 GB hard drive and 4 GB of RAM, the Vaio only covers the minimum standard of current notebooks. The system memory is on a single module, running in single-channel mode, without any significant performance decrease. 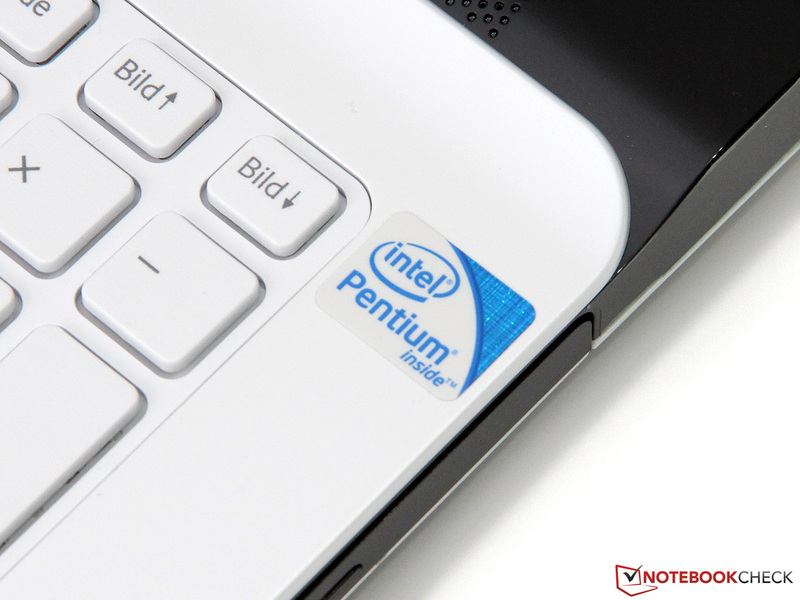 The Pentium B980 does not promise any miracles, but it delivers good performance in comparison to the competition. In the Cinebench R11.5 the CPU with 1.85 points is placed right between AMD A8-4500M (1.75 points) and the top model A10-4600M (2.0 points). In applications that do not require more cores, the B980 can even perform on par with the Core i3-2370M, running at the same clock frequency. 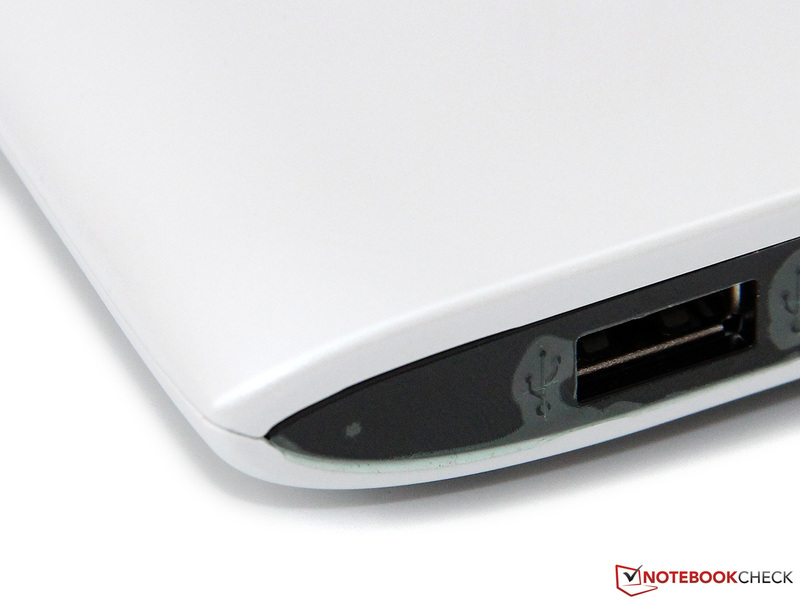 In addition: the full performance potential is also available on battery power. Sony also offers the SV-E1712 with the Ivy Bridge models Core i3-3110M, i5-3210M and i7-3632QM. 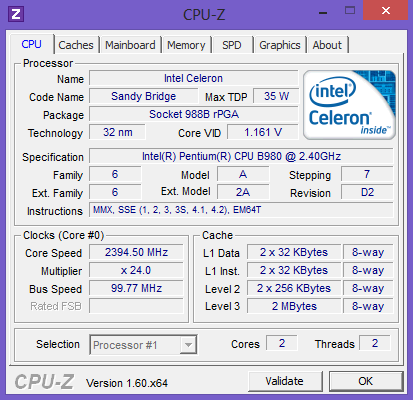 Compared to the Pentium B980 and depending on the application, they promise a power increase of 5 to 30 (Core i3), 40 to 65 (Core i5), and 45 to 220% (Core i7). The hard drive of the Vaio is supplied by Hitachi, and is a 2.5-inch unit with 500 GB capacity. The slow speed of 5400 rpm causes the access times to suffer, resulting in the high value of 21.3 ms (HD Tune). The sequential transfer rate of 85 MB/s seems fair and this is where the high data density of the single hard drive plate pays off. In addition to the processor power, the PCMark series of benchmarks by Futuremark are strongly influenced by the hard drive speed - not the ideal conditions for our test candidate. In the PCMark 7 it scored 1949 points and surpasses the HP Pavilion g7 only slightly. But what do these values mean for the everyday use? 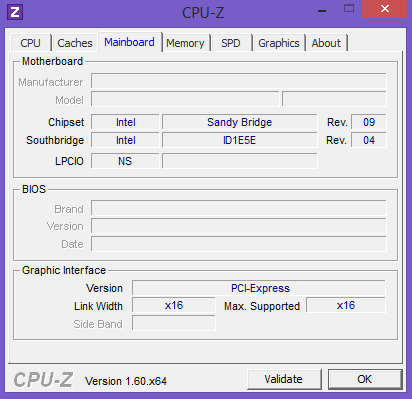 In principle, even a cheap Pentium processor is enough for almost all desktop applications. In simple internet browsing and office applications, the user should be able to tell a difference with the significantly more expensive Core i7. Things change when it comes to demanding image or video editing - the B980 will still do the job, but is a lot slower. It is recommended to consider the upgrade to an SSD, which would reduce the loading times of the operating system and the applications. 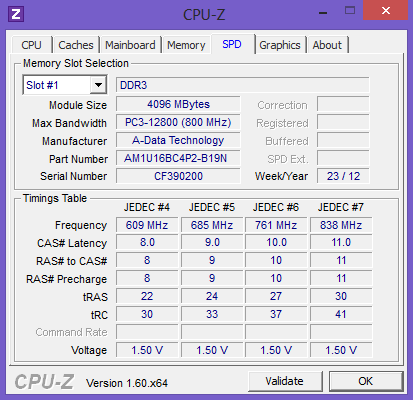 The AMD Radeon HD 7650M is a lower clocked version of the 7670M (500/900 MHz instead of 600/900 MHz for core/memory), both of which are based on the older HD 6650M. The chip, produced in 40nm process, features 480 shader units and a 128 Bit memory bus, with 1 GB of DDR3 VRAM. The Radeon HD 7650M competes with Nvidia's middle class models GeForce GT 620M and 630M, scoring in 3DMark 11 a total of 1061 points (battery power: 729 points) in the performance preset. 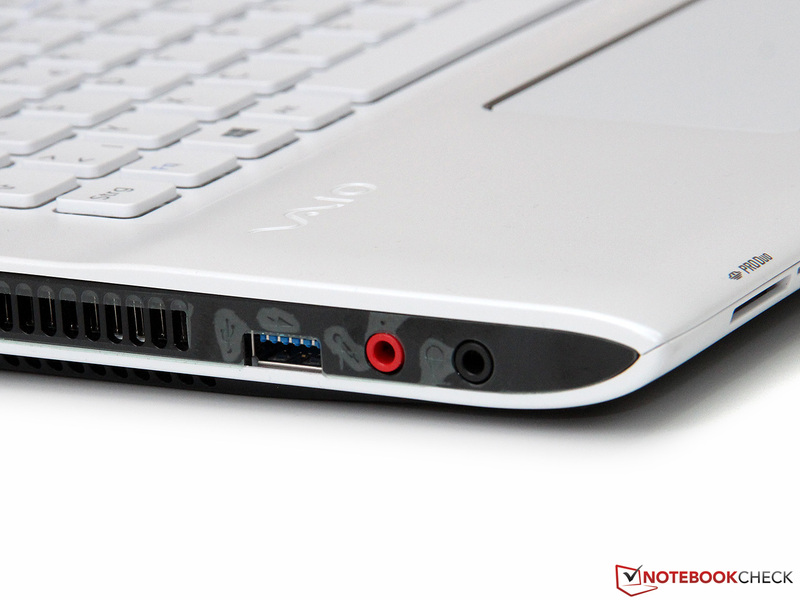 Thanks to the CrossFire graphics solution, the Pavilion g7 surpasses the Vaio by almost 100%. Here, we must clarify: the synthetic 3DMark does not take into account the micro stuttering problems or the lack of driver support that a lot of games encounter with CrossFire. The combination of Pentium B980 and Radeon HD 7650M is usually enough to play current 3D games in medium settings smoothly. Still, the performance does not always suffice for the native resolution of the display; with a small reduction down to 1366x768 pixels, frame rates of at least 30 to 40 fps are possible. 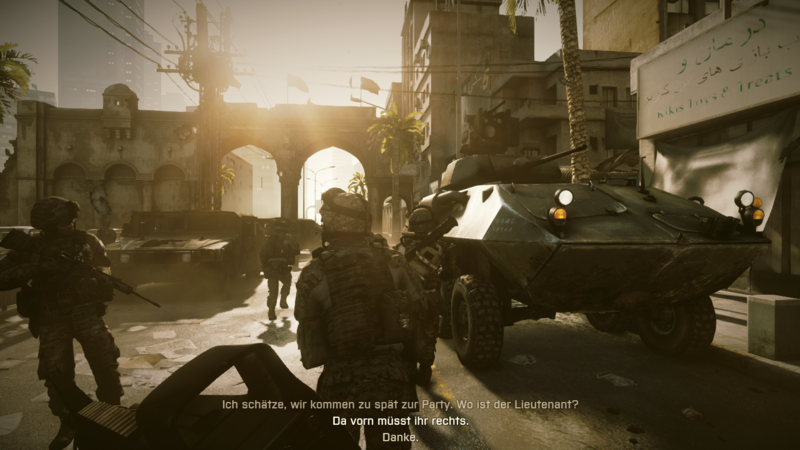 Exceptions to this are games such as Battlefield 3, which would benefit from a faster graphics card, especially in the higher settings. 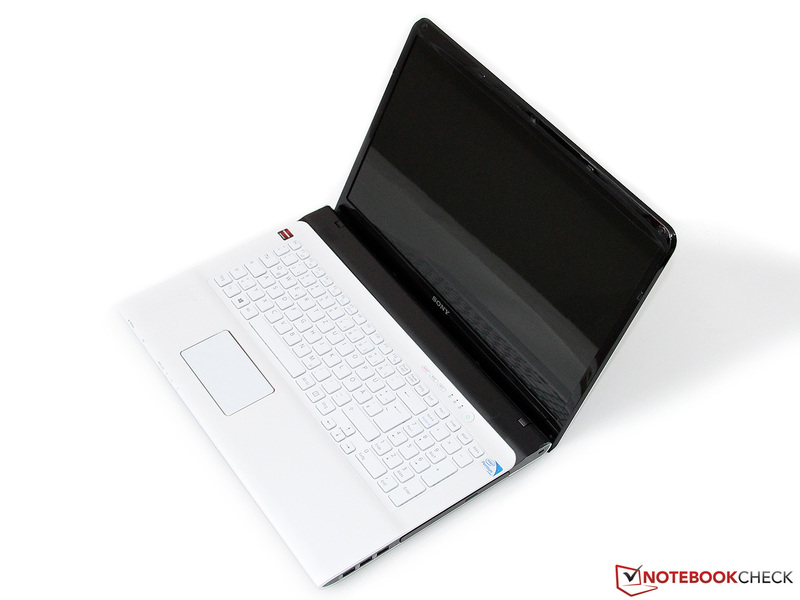 Despite the relatively efficient components, the Vaio SV-E1712 is not among the quietest notebooks in its class. The fan is not only constantly active, but at 35.5 dB(A) in idle it is almost as loud as other devices under load. However, due to the uniform and low-frequency noise, at least the notebook remains bearable. 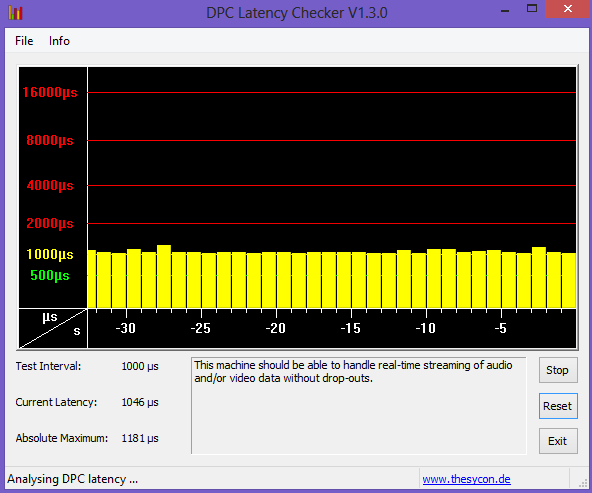 The HP Pavilion g7 at 31.6 dB(A) shows us how this can be done better. In 3DMark 06 the noise level rises only slightly to 37.9 dB(A). This fuels our impression that the fan control could have acted a bit more on the defensive side during office use. Under full load, meaning Prime95 and FurMark, we measured a maximum of 44.4 dB(A) - the Vaio would not be even close to this value during normal use or gaming. In contrast to the noise level, the temperatures give us no cause for criticism. In idle, the values rarely exceed the ambient level, which is largely due to the somewhat overzealous fan. Operation on the lap is possible without any restrictions. While the temperature around the air outlet reached 45 oC under full load, most of the other areas of the notebook remained cool. This is particularly good news for the gamers, who will not have to worry about hot palm rests even after prolonged gaming sessions. In the end, the question remains: how does the hardware fare in the case? After all, the Vaio can also be equipped with significantly faster and hungrier processors. 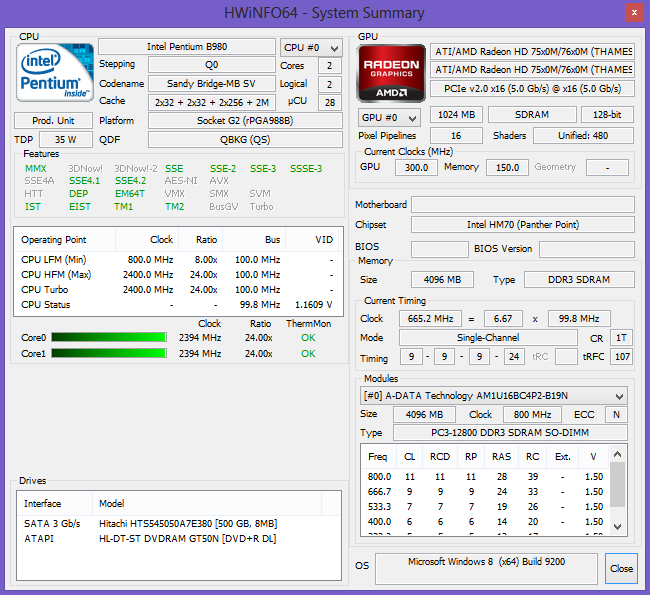 The Pentium B980 causes the notebook no significant problems and at a maximum of 80 oC works with 2.2 GHz. The minimal throttling of 200 MHz is due to the unrealistically high load - this will not occur in practice. 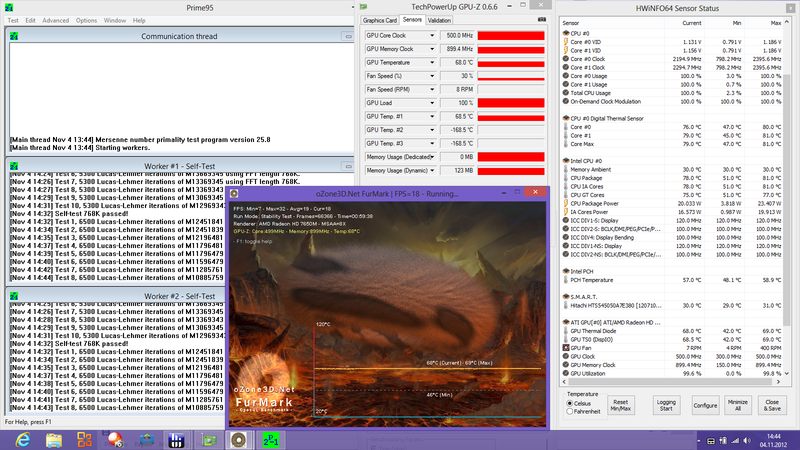 The graphics card seems to be completely safe from throttling, its core reaching a maximum of 70 oC. (-) The average temperature of the palmrest area of similar devices was 29.1 °C / 84.4 F (-4.5 °C / -8.1 F). Large grills, but with nothing behind them: the stereo speakers of the SV-E1712 can be described this way (slightly exaggerated). They are relatively loud, but not particularly good. The sound lacks bass and is flat. If possible, external speakers or headphones should be used. Too bad - we expected more of a multimedia oriented notebook. We must note here that the competitors offering higher quality speakers are in at least one price class above our test candidate. As we mentioned earlier, Sony has not installed AMD's power saving technology Enduro. This leads to unnecessarily high consumption in idle. At 12.2 to 17 W it fares worse than the competitors - we reckon at least 3 W are due to the constantly active Radeon GPU. Although the graphics chip and the processor are not manufactured by the latest process, the Vaio fares well under load with 46 W (3DMark 06). During the stress test, this value rose to the still acceptable 62 W. Overall, the energy consumption is on par with the HP Pavilion g7, which offers a somewhat stronger graphics solution. The power supply provides a maximum of 75 W, which seems appropriate in view of our measurements. Many manufacturers have already shown that even a small 44 Wh battery in conjunction with an energy efficient system can produce considerable battery life. 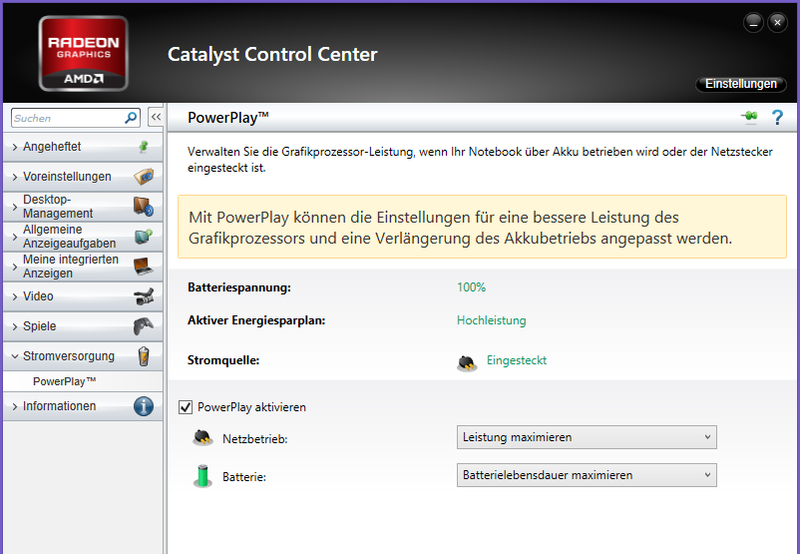 Unfortunately the Vaio SV-E1712 does not meet these conditions, as we already described in the Power Consumption section. We begin with Battery Eater Reader's test (minimum brightness, energy saving mode, wireless modules off): without any load, the battery is out in just under 4 hours. There can be no comparison to the Pavilion g7, which easily lasts double that time. 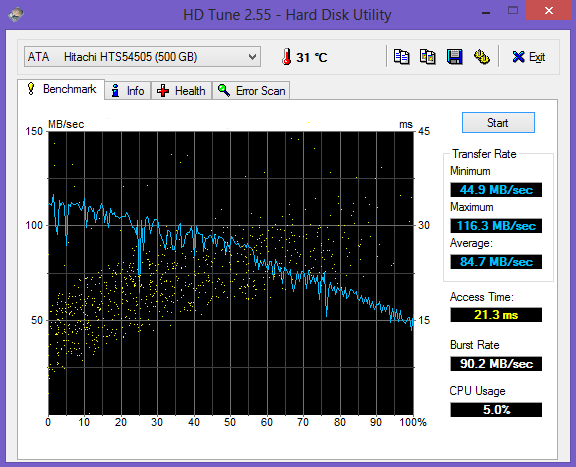 Even in the more practical WLAN test (150 cd/m², energy saving mode), the Vaio does not fare better. Although the difference with the competitor from HP shrinks, the 2 hours and 36 minutes is not an excellent value. 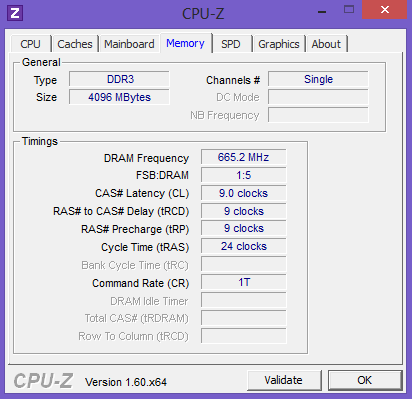 In order to increase battery life, the manufacturer has restricted the clock frequency of both the core and the memory of the graphics card to 400 MHz. Despite these measures, the Battery Eater Classic test (maximum brightness, high performance mode, wireless modules on) finished in just 52 minutes. You should therefore give up the idea of playing games on battery power. 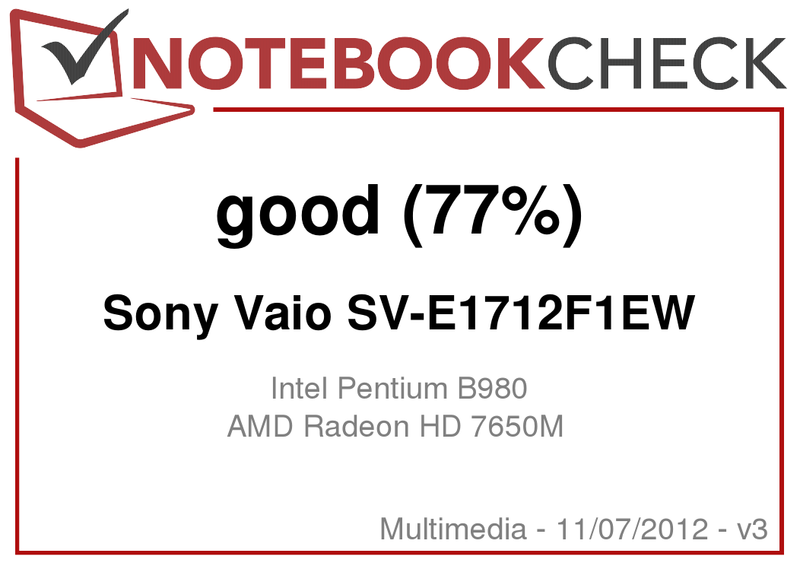 The Sony Vaio SV-E1712F1EW did not run through our test course perfectly, but showed rock solid overall performance, and proved: nowadays, there are attractive notebooks that do not cost a lot and have sufficient capabilities for a number of everyday tasks. 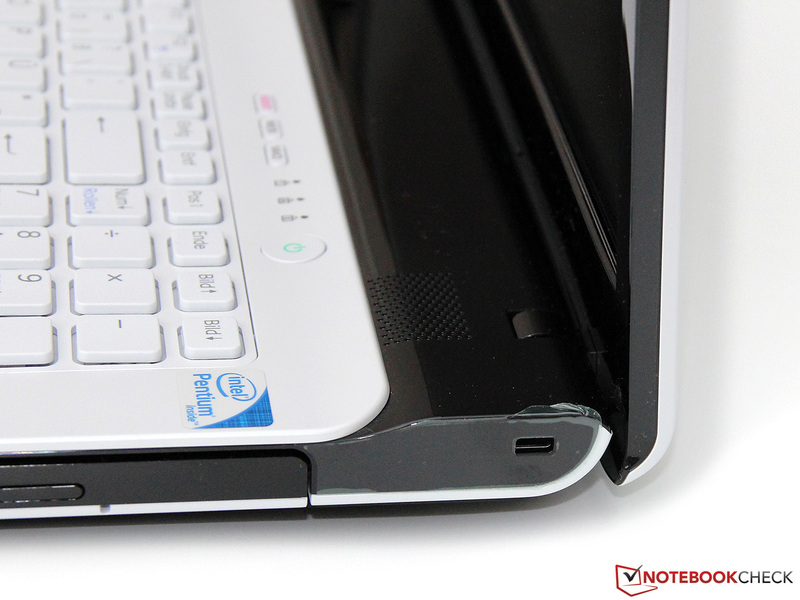 Many budget notebooks lack acceptable workmanship or stability. Sony also had to make economies here and there and has not used expensive aluminum. Nonetheless, the simple, but not cheap-looking, case manages to surpass many similar or higher priced alternatives. 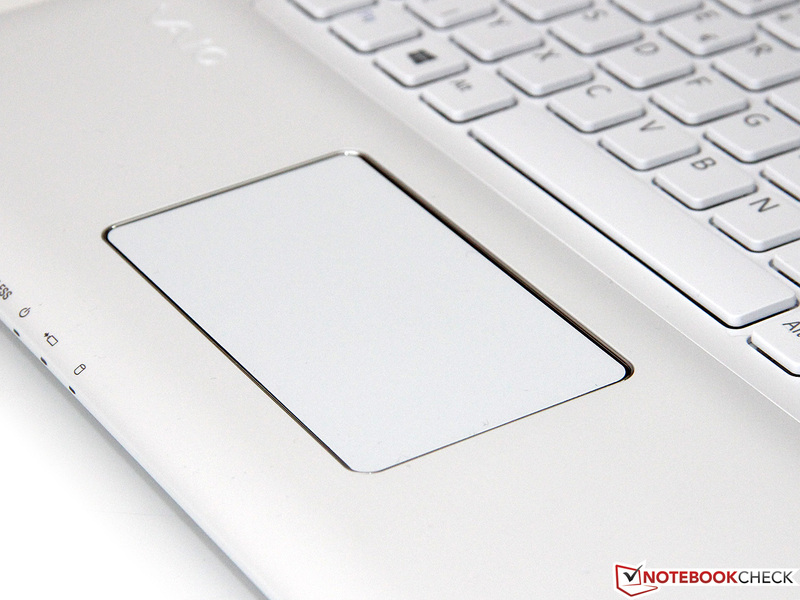 In combination with the properly good input devices, the Vaio makes for a good office notebook as well. But how does it fare with playing movies or games? 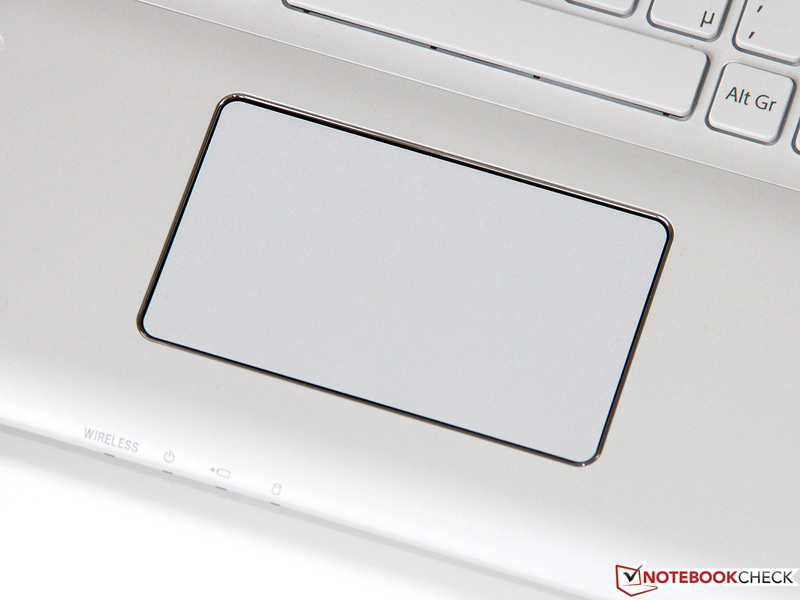 Unfortunately, the 17-inch notebook has left us with mixed feelings. Film fans will be disappointed mostly with the tight viewing angles of the display and the weak speakers. The latest gaming hits can only be played smoothly on low to medium settings, which was expected of the hardware components. All of this may be excused with the low price of less than 550 Euros (~$700). Sony definitely should have included the missing Endure support as well as fixed the somewhat disturbing fan in idle state. Possible alternatives, such as the HP Pavilion g7, are also not free from weaknesses and perform worse in other disciplines. Ultimately, the buyer should choose the device that meets their own personal requirements. and qualify the Vaio for office use. We recognise the various shortcut keys from other Sony models. which can be opened in two places for maintenance. only the hard drive and system memory can be replaced. thus leading to less than 4 hours in idle state. for Windows 8 and various other applications. 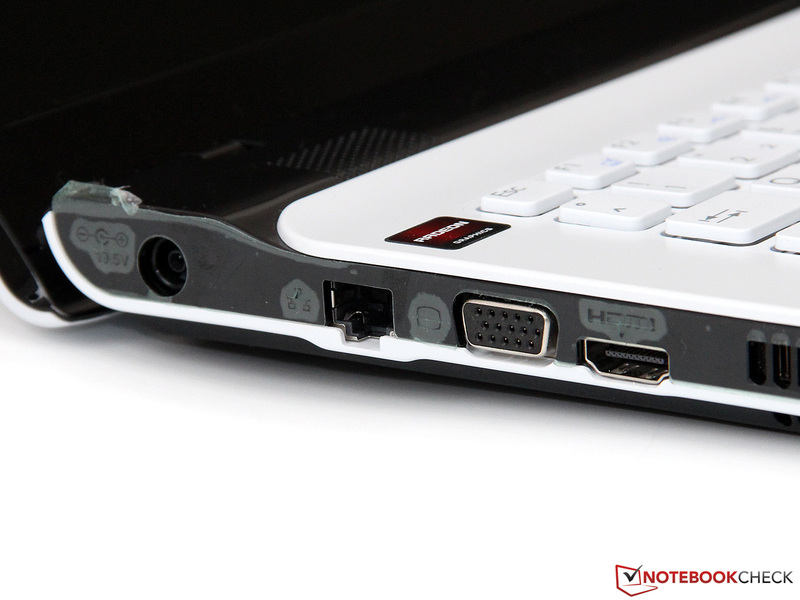 but instead an inexpensive entry-level multimedia notebook. The Sony Vaio SV-E1712F1EW is available at 550 Euros (~$700). workmanship and stability are above average. of which only one supports the new 3.0 standard. the interfaces are rather poor. The 75 W power supply should always be carried with the notebook. 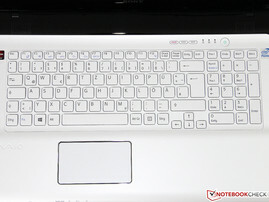 Unlike many inexpensive rivals, the Vaio score points with relatively higher quality workmanship and good input devices. We were less convinced with the poor viewing angles of the display and the disappointing speakers. If Sony were to improve these points, the multimedia qualities would be even better. One does not need more than 1000 Euros (~$1273) in order to acquire a versatile and sufficiently fast 17-inch notebook. Even with a Pentium processor and a middle-class graphics card, the Vaio SV-E1712 meets the needs of many users and is suitable for gaming - as long as the customer is willing to compromise with resolution and details. We have focused mainly on the HP Pavilion g7, although there are a number of alternatives: Lenovo's G780, the Acer Aspire V3-771G and the Packard Bell EasyNote LS11-HR are in the same price range, depending on the configuration.